‘We fought the case on a couple of grounds,’ he says. ‘Firstly that the government’s test methodology was incorrect and secondly that the listeria strain in question was not a harmful one. Professor Hugh Pennington championed our cause and eventually sense prevailed and we won the case. The cheese is hand-made by introducing Penicillium roquefortii mould at the start of the process to encourage blue-green veining, along with vegetarian rennet to set the curds. These are ladled into forms and allowed to settle into shape. During the maturing process, the cheeses are twice dipped in brine then put into clean forms. They are removed after a month, wrapped in foil to prevent growth of surface mould and left in a cool room for a further two months. Turning three times a week ensures they ripen evenly. Before sale, they are hand-scraped and wrapped in the distinctive foil pack designed by Humphrey’s brother Tom Errington. Errington explains that cheese made at different times of the year can vary, as the ewes’ milk is affected by seasonal changes in their diet. The sheep are only milked between January and September, but Lanark Blue is available all year. ‘Following the success of this cheese we developed Dunsyre Blue a cow’s cheese which is also mould ripened and hand-made,’ he says. The unpasteurised milk for this cheese comes from a neighbouring farm at Dunsyre – hence the name. Two white cheeses followed, one made with ewes’ milk named Lanark White and another, Maisie’s Kebbuck, from cows’ milk. This cheese was made for Humphrey’s mother-in-law Maisie, who does not like blue cheese, and very proud she is of it. 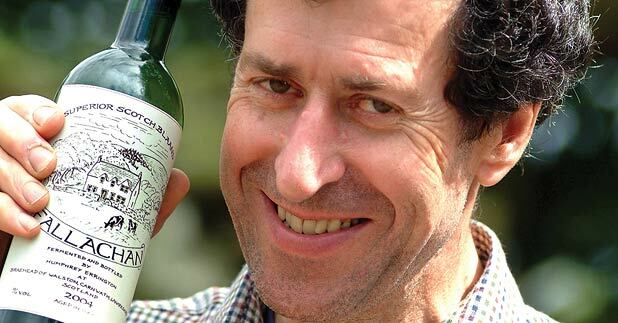 In 2005 he developed Fallachan, a fermented alcoholic drink made from the whey left over when curds are separated from the milk. It uses an ancient recipe and needs to mature for a year in oak casks before bottling. Errington’s cheese is sold all over Scotland and the UK and can be found as far afield as Hong Kong and the USA. With his daughter Selina working full-time in the business, he takes time to make regular personal deliveries to many of his Scottish customers and values the feedback he receives.